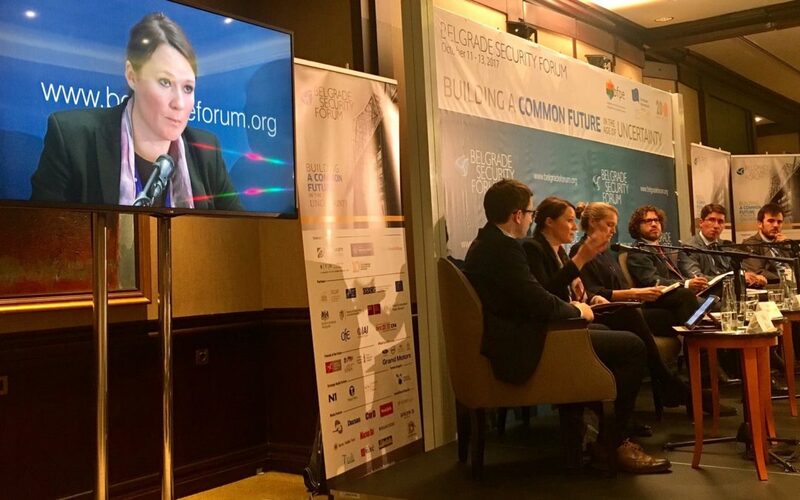 CEP representative Ivana Boštjančič Pulko joined Belgrade Security Forum, titled “Building a Common Future in the Age of Uncertainty”, held in Belgrade between October 11th and 13th, where more than 100 speakers have joined in various sessions, plenary panels, round tables and break out events to discuss how can we build a common future in an age characterized by uncertainty? 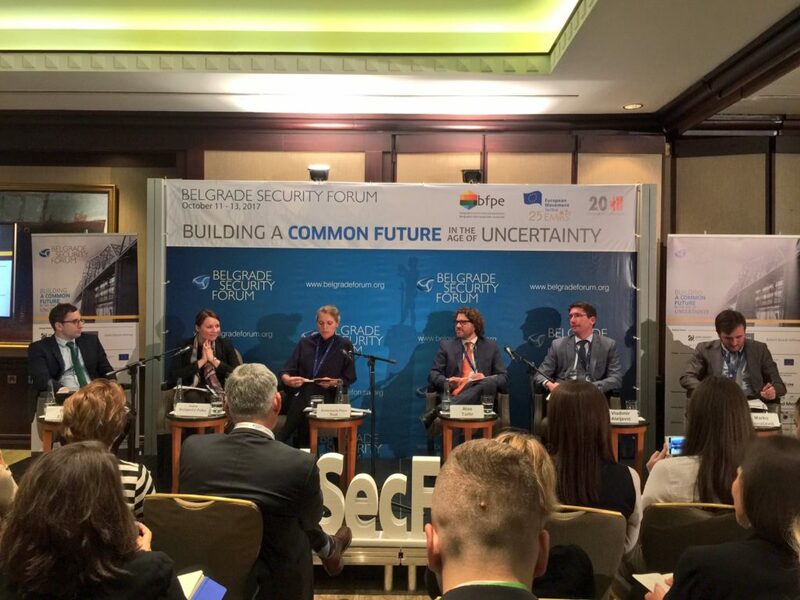 Ms Boštjančič Pulko participated as a speaker on a panel “The EU as a crisis management actor: CSDP in neighbourhood” that analyzed the EU missions in Kosovo, Bosnia and Herzegovina, Somalia, and the Occupied Palestinian Territories, in order to discuss the issues of local ownership in peacekeeping missions, planning capacity of CSDP missions, missing elements in the EU missions, as well as how the EU missions might aid and abet authoritarianism. Ms Boštjančič Pulko focused her presentation on Evaluating Planning Capacity of CSDP Missions: the Case of EULEX Kosovo and EUFOR Althea, where she presented a catalogue of lessons learnt and identified best practices in CSDP planning process. The findings are based on interviews conducted in Kosovo and Bosnia and Herzegovina in 2016 in the framework of a H2020 project ‘Improving the Effectiveness of Capabilities in EU Conflict Prevention – IECEU’. The findings list that both missions suffer because CSDP is low on political agendas of EU member states, there are too many partial interests within EU member states hampering effective planning, decision making in CSDP is generally too long, ‘Brussels’ lacks proper situational awareness on the ground, clearly set goals and exit strategy are missing and the EU does not have an overall preferred strategy for both countries. There are at least four phases led by four different bodies in the case of EULEX planning process but there is a well elaborated analysis and lessons learned process, only the implementation of the findings on the operational level is rather weak. The planning capacity of EUFOR Althea profited greatly from the access to NATO planning assets, structures, and capabilities under Berlin Plus, along with infrastructure on the ground, provided by SFOR. In principle, a clear military command structure, a solid reporting system, and the availability of NATO assets provide a very good basis for real-time situational awareness. Ms Boštjančič Pulko explained the reasons behind choosing to compare two missions in the Balkans.